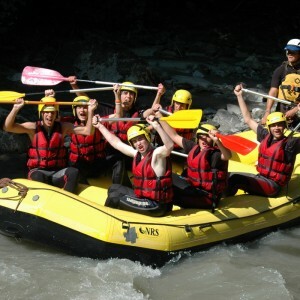 The Scout section provides vibrant adventure for young people 10 1/2 to 14 years of age. In partnership with their leaders, Scouts develop leadership potential, independence and learn new skills. Gateshead Scouts seek to become active and engaged members of the local community. Adventure is at the heart of Scouting. As well as weekly troop meetings, Gateshead Scouts thrive in the outdoors, undertaking regular camps and a host of activities from canoeing and climbing, to orienteering and bushcraft. Scouts is a dynamic section, that actively creates the leaders of the future. Contact your local Scout group and being your own adventure today. Rafting: just one of many Scout adventures.